Where did the last two weeks go and what have we been doing? I have no idea to both of those questions. We had planned on heading to the coast, but couldn’t get a site for two weeks because all of the weekends are already booked up. So, we are back at the Escapee CO-OP Pair-a-dice RV Park in Pahrump, Nevada. We were here last November and you can read about it at: November 2008. One thing I wrote then was “The Pair A Dice CO-OP RV Park is one of the nicest parks we have been to and is in a very quiet area. We came here to relax for a few days and have ended up staying for 10 days. Everyone here is very friendly. It usually takes us an hour to do Raider’s morning walk, because everyone wants to pet him and take time to chat.” Quiet RV Parks are hard to come by because RV Parks are usually located next to major highways and train tracks. Pahrump Valley has no Interstate highway, no trains and as far as we can tell no airport of any kind. The RV Park is located about 3 miles from the nearest highway of any size and about 5 miles from the center of town. Like all RVers the channel we watch most is The Weather Channel. We have been amazed at all of the rain, snow, blizzards, flooding and tornadoes happening all over the country. Here in Pahrump everyday has been mid-70s or better. We have had a couple of very windy days, which are good days to stay inside and read. All of the other days have been good days to sit outside and read. So, I guess what we have been doing for the past two weeks is reading and beading. We have also been taking Raider for two walks a day around the park to get us all some exercise. If we walk up and down every row it is a 2 mile circuit. We have made a couple of visits to a small casino nearby with good, cheap food and yes we did make a few contributions at the slot machines as well. We also made a brief pass at Ash Meadow National Wildlife refuge but didn’t see anything of note. At our feeders here in the RV Park we have had Lesser Goldfinch, House Finch, Mourning Doves, House and White Crowned Sparrows foraging on what the little guys dropped and occasionally Gamble’s Quail. We have also had Cooper’s Hawks come by almost daily to see if they can scare up some Goldfinch dinner at the feeders. Today we are having the Montana waxed for the first time, it needed it badly. One of the other guests in the park had somebody doing a wonderful wax job on his jeep. We recognized the vendor from last November when he was detailing an Excel Fifth Wheel. After the tens of thousands of miles we’ve put the Monty through, it deserved a professional job! Your travels sound like so much fun! I can tell you're having the time of your lives. Keep those posts coming...I enjoy reading them! It all sounds like Heaven to me! You are living my dream! I knew you guys would be watching The Weather Channel in some kind of "Paradise" while we got battered with a very unseasonable sleet-storm. 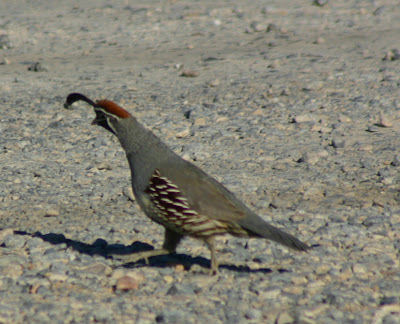 Oddly though I've yet to see a Quail in all the time I've been in Chicagoland. They maynot have quail back there so look for a Bob-White. I had to look that up. I don't recall seeing any of those, but now I know what to look for.